Say that five times fast! 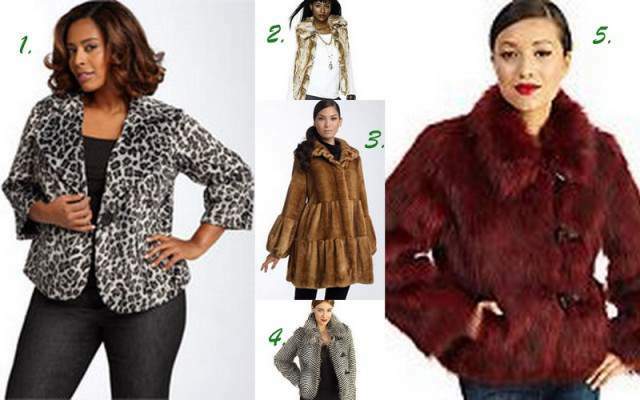 Whether the rain or the chilly weather has you chilly, bundle up in style with the latest gems for the plus size fashionista!Â With the faux fur trends sashaying into hotness, you too can partake in this with the latest finds by some of the most delectable designers! AtÂ Nordstrom, but I think now sold out- but fun! I am diggin the Red Faux Fur Coat! The Faux Fur looks- is it for you?? I saw #3 at Macys last week. I couldn’t believe how fur-like it was. It even felt very close to real fur. Ohhh! Was it just as cute as in the picture? It was! I have 2 real furs (a mink and a Finnish raccoon), and I normally pay no attention to faux furs. But, this one caught my eye. If I didn’t have so much Christmas shopping to do, I would have gotten this as a treat to myself. I’m going to look for it after Christmas, though, because I am definitely going to buy it if it’s still there. Fell in love with #3 when I saw it in the catalog. Luckily I have a good relationship with Nordstrom and was able to get my hands on one. If anyone is out there looking for one, be sure to go one size smaller as it runs large. Great tip! I wanna see pics!! !